What in the world is going on here?? What are these spikes coming out of the ceiling? Is it some kind of deadly trap for Indiana Jones or Lara Croft? Well, no, but they'll hurt like the dickens if you try exploring them without a hardhat. In some of the previous posts in this short series we explored the deep heart of the magma chamber beneath a volcano, and we went both on and above Mt. Shasta to see the dramatic exterior of a volcano. Today we burrow under the skin of a volcano. Medicine Lake Highland is the biggest volcano in California. It may be barely half as high as Mt. Shasta, but it makes up for the height deficit with broad gentle slopes, giving it a volume of around 130 cubic miles, compared to about 85 for Mt. Shasta. It is classed as a shield or "shield-type" volcano, composed largely of basalt, but with varying amounts of andesite and rhyolite. As such, it displays a wide variety of volcanic phenomena, not the least of which is a dizzying array of lava tubes. A flank of the volcano is preserved as Lava Beds National Monument, and the park has within its borders the highest concentration of lava tubes in the country, if not the world. 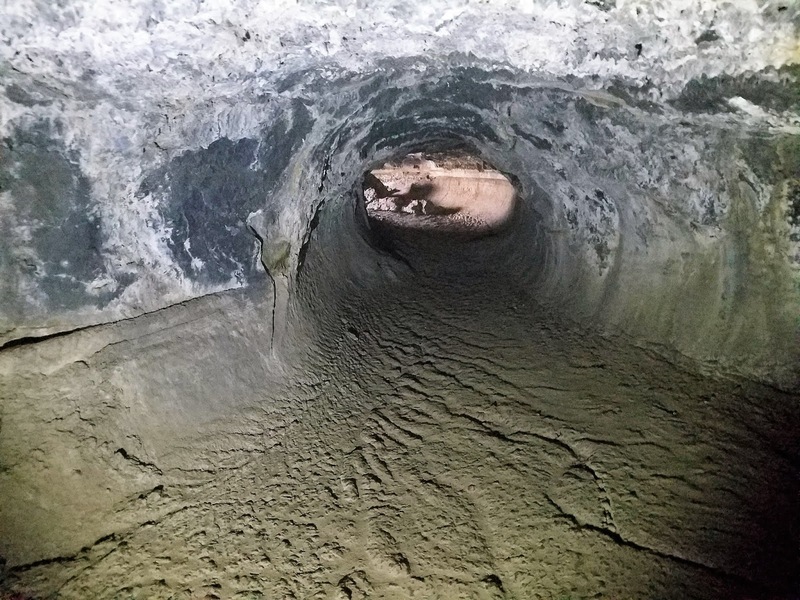 More than 700 individual caves are known at Lava Beds with a total length of more than 70 miles. 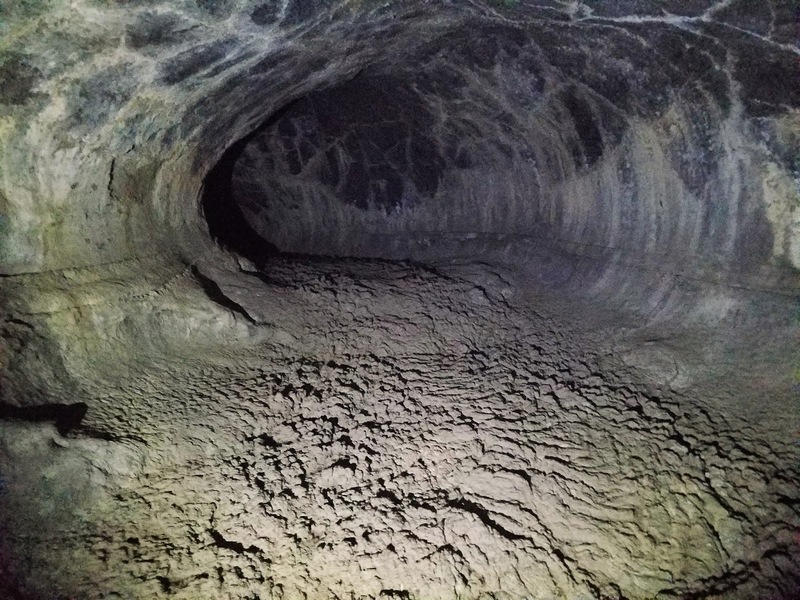 How do lava tubes form? The picture above shows an active lava flow at Pu'u'o'o Crater on the Kilauea volcano on the Big Island of Hawai'i in 2009. 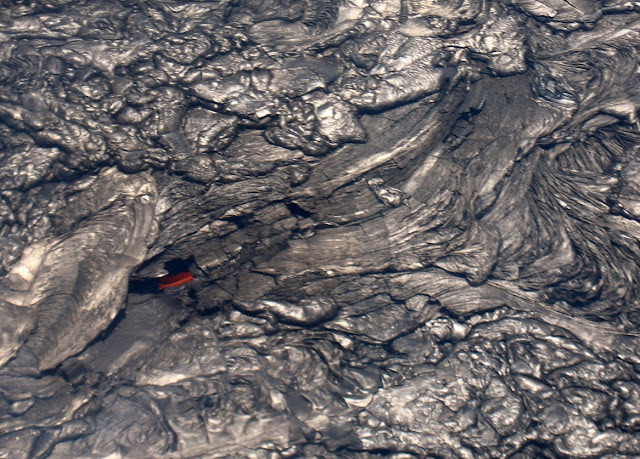 The scale in this aerial view is difficult to discern but the skylight (where the red lava is visible) is probably 30 feet across. The tubes develop when river-like lava flows crust over. The lava continues to flow just beneath the surface, sometimes for many miles, being insulated by the overlying crust. The flow in the picture above flowed seven miles to the shoreline and was only a few tens of degrees cooler than it was when it emerged at the vent of Pu'u'o'o. When the eruption ends, the lava drains from the tubes. The tubes can be quite complex, with bifurcating passageways and multiple levels (one particularly complex cave is called the Catacombs). 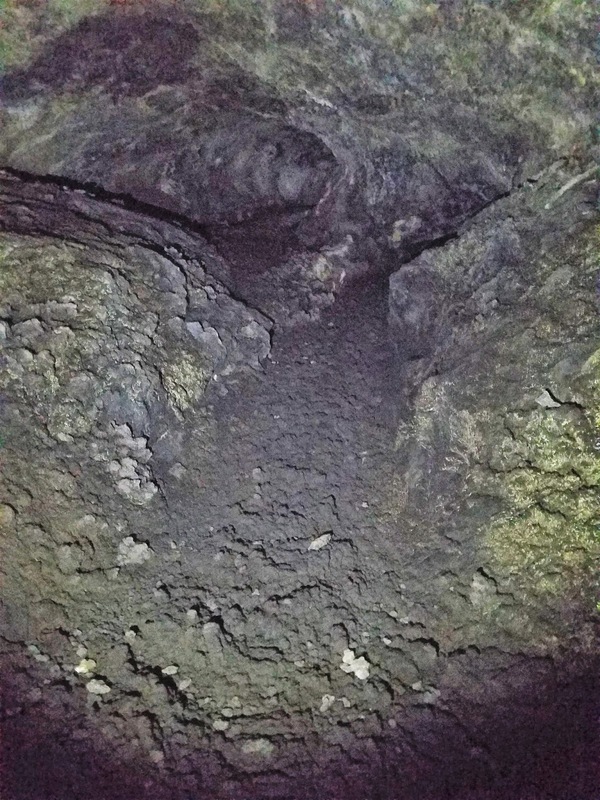 During our recent visit at Lava Beds we explored Valentine Cave, one of the most accessible in the park. The majority of the tubes are in the Mammoth Crater flow which is around 30,000 years old. 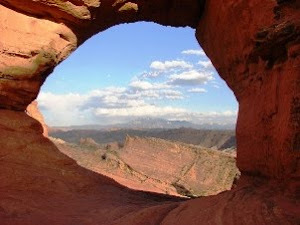 Valentine is in a younger flow, around 12,000 years old, so it has less collapse debris than many of the older caves (although it is true that many fallen boulders were removed by CCC workers during the Great Depression). In any case, the passages are easy to negotiate. Being composed of very dark rock that tends to absorb light, tubes are notoriously hard to photograph. Flash photography tends to produce washed-out photos with little depth. I was using a bright flashlight for illumination and was holding it at arms length to get shadows that provide a sense of depth. I tried using my normal 'sophisticated' camera, but I actually got better results from my Samsung phone! 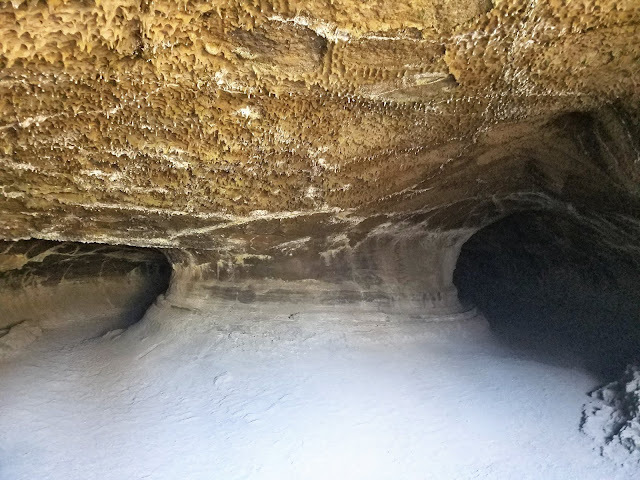 There are many interesting flow structures in the caves, including the pahoehoe flows on the floor of the caves, and "bathtub rings" on the walls showing that some flows only filled the cave a third full. The basalt fractured as it cooled, forming the numerous cracks in the roof of the cave. Subsequent weathering in the soils above produced sodium bicarbonate and other chemicals that stain the edges of the fractures. A lava cascade emerges from a side passage in Valentine Cave. 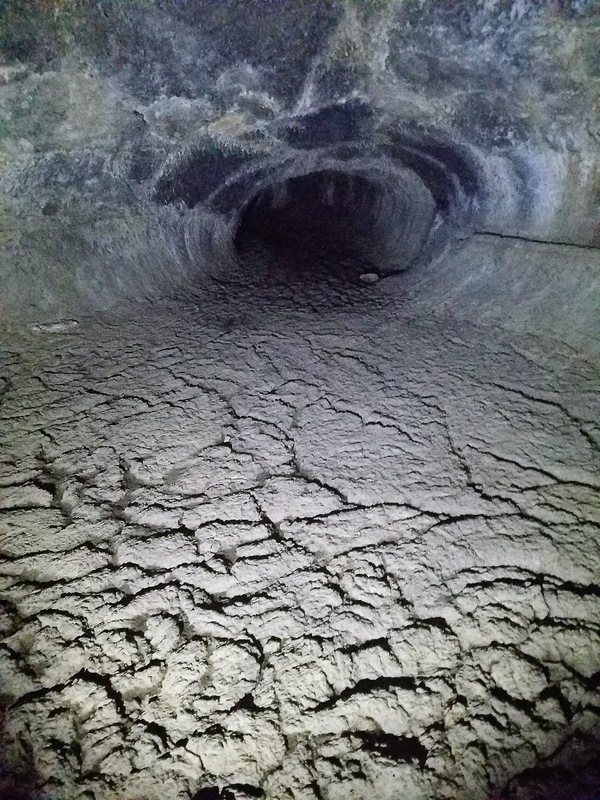 The lava tubes of Lava Beds National Monument are a fascinating environment to explore. Some of the caves have multiple levels, and some are decorated with permanent ice. One, Fern Cave, has numerous Native American pictographs and also ferns, which is interesting because ferns are not otherwise found in the park; they are a species of the western Cascades. The cool damp environment of the cave provided the right conditions for the plants, which may have arrived on birds feet (I'm guessing here). 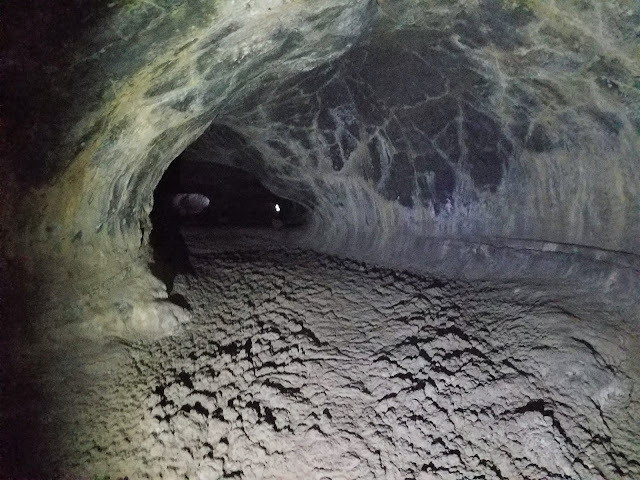 There is a lot to do in Lava Beds. The ice cave and Fern Cave can only be visited with a ranger guide, but around twenty caves are open and developed for unaccompanied exploration. One, Mushpot Cave, is lit and has interpretive signs, and even a small amphitheater for ranger talks. 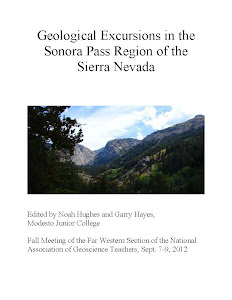 On the surface there are lots of hiking trails that allow for the exploration of cinder cones, spatter cones, fault scarps, and the human history of the region (which will be covered in a separate post). All in all, it's a good place to get under the skin of a volcano!